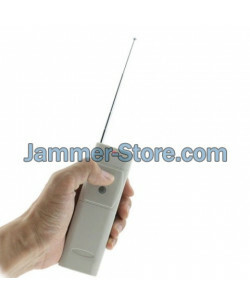 433MHz remote control jammer is a small device that works against all remote controls of the chosen frequency in the 25 meters radius. Among the devices it can effectively deal with you might spot remote controls from many toys like planes, cars, boats and so on, garage door remote controls,.. 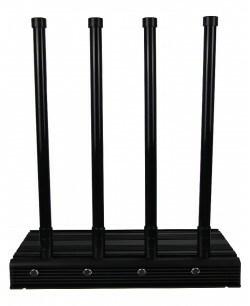 This powerful desktop jammer with 4 directional antennas can be configured to jam any 4 in radius between 50-150 meters. The jamming radius of each antenna/frequency can be manually adjusted with the special regulators. 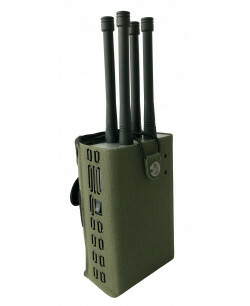 The power of each antenna is between 20W-40W, making the total output powe..
TRC-3 is a universal remote control jammer that can stop the work of all commonly used remote controls. Among them you will find ordinary TV and air conditioner remotes, car lock remote controls, remotes of the toy cars and planes of your kids, garage door remote controls, and so on. So if y..
Standard remote controls of all kinds use three main frequency bands – 315MHz, 433MHz and 868MHz. Those are all remote controls which we use every day of our life, including remotes from TV, air conditioners, garage doors, car locks, toy cars and planes which our kids play in the yard, and many more. All those electronic devices are remotely controlled with the help of one of those three remote control frequency bands. Our remote control jammers from this category – car remote jammers – may be used to make any of those remote controls useless. While this application of our devices might seem only for fun, they have far more serious implementation as well. Remotely controlled robots, Unmanned Aerial Vehicles (UAVs) and other surveillance drones operated by humans with the help of remote controls are getting very popular these days. Due to the high price of the professional surveillance drones like quadrocopters many enthusiasts are trying to make their own, cheap but working prototypes of spying robots for personal usage. And those robots work quite well! So you can choose a jammer for any type of robot in this category as well. There are flying, ground driving, jumping, wall climbing models and even those which might be thrown into your house by the person that controls it and only then it will be used as the driving surveillance drone. Those things have great potential for intelligence agencies and the only way you can quietly and effectively stop them is to break connections between drones and their remote controls with the help of our remote control jammers. By the way, if you are the person who is trying to avoid being spied by the government, surveillance drones are not the only things you should be aware of. For example, there are CCTV cameras on many streets of dozens or maybe even hundreds of cities in the USA and other countries of the world. 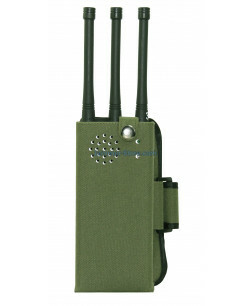 In order to have a nice protection against low frequency surveillance you need to use UHF/VHF Jammers which are the only kind of devices able to deal with the problem.